Aramith 2 1/4" Crown Standard Belgian ball set. 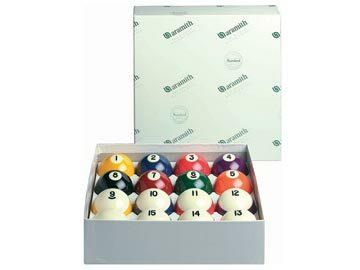 This full set of 16 billiard balls is of the highest quality (A grade). You can expect these billiard balls to last 10 to 15 years without problem. The balls measure the standard 2-1/4" in diameter and are regulation weight. Aramith Crown Standard billiard balls have the most strict tolerances in weight and size variation and color calibration.